Alaska may appear to have limited higher education opportunities due to its remote location and low population, yet a closer look shows otherwise. Students who live close to major cities can attend Alaska Pacific University or one of the three University of Alaska campuses, while smaller towns are home to several technical schools and Christian colleges. In addition, four-year colleges in Alaska offer more than 100 online programs between them, making higher education accessible to anyone with a reliable internet connection. Start your Alaska college search, see which schools are the most affordable, and find invaluable college planning resources in the following guide. No matter what students want to study when they go to college in Alaska, they should be confident that they're receiving the best education their tuition can buy. In order to help students see what schools have to offer, we've ranked the top colleges in Alaska based on criteria such as price, financial aid opportunities, and the ratio of students to professors. Find out how schools ranked below. All students have their own individual needs and career goals. As a result, it's imperative for them to find the school that will best position them to be successful in their chosen professions. 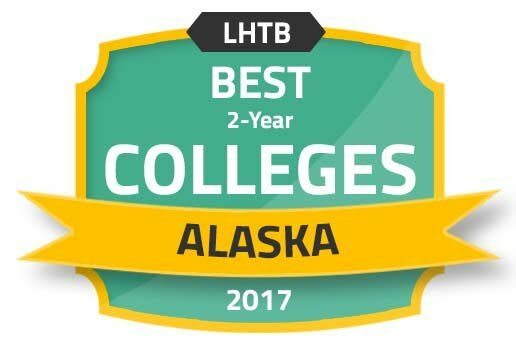 Students who are looking for colleges in Alaska can use the search tool below to find the school that is best for them. Compare schools based on price, size, and location to help make this important decision. Established in 2009, the Alaska College and Career Advising Corps is designed to encourage more high school students to attend college and pursue high-skill careers. The initiative - part of the national College Advising Corps movement - employs recent college grads who visit high schools to connect with local students. These mentors help students map out career plans, register for admissions tests like the ACT and SAT, research college options, and apply for financial aid. With less than 50 percent of Alaska high school graduates pursuing higher education, this program hopes to make significant inroads on the state's college enrollment rate. Held across 25 communities, College Goal Alaska is a series of events where students and their families can get help filling out FAFSA® paperwork - free of charge. Both volunteers and financial aid professionals are on hand to provide assistance. Dependent students should come with a parent or legal guardian while all students should bring appropriate tax forms and identification. Check here to get more information, check the upcoming schedule, and register for an event. This free online resource arms Alaskan college students and recent graduates with core money-management skills. From setting a monthly budget and understanding credit scores to examining the financial benefits of graduating and paying off student loans in a timely matter, this site provides an invaluable resource for keeping student debt to a minimum. The cost of attending college in Alaska depends on what type of school students enroll in and whether or not they receive financial aid. This section compares tuition rates in Alaska to national averages, as well as the amount of financial aid students in the state generally receive. Cost is a key factor in the college decision-making process – yet tuition rates don’t tell the entire story. Below we’ve listed the six-most affordable colleges in Alaska based on net price, which accounts for financial aid received and more accurately represents the cost of attending college. College is a huge investment, so students need to know that they're getting an education that can yield a good return on their investment. The list below provides information on which colleges in Alaska have alumni that make the best salaries within ten years of entering college. In 2014, the Alaska State Legislature passed a measure that would create more favorable terms for those who get student loans. Even with this type of assistance, students are still concerned about keeping their student loan obligations to a minimum-which is highly influenced by what school they choose to attend. This section outlines which colleges in Alaska have students with the least amount of student loan debt after graduation. Tuition is not the only expense students who attend college in Alaska must consider. Investopedia reports that although the rent in large Alaskan cities is lower than many other major cities in the country, residents do pay more for utility bills and groceries. This section provides a more detailed look at the cost of living in Alaska by comparing rates of expenses such as housing, groceries, transportation, and health care to the national averages. Anchorage is one of Alaska's largest cities, and it is also considered one of the most livable cities in the country. Students who graduate from colleges in Anchorage often find employment in some of the city's most popular industries, which include the education, health services, and hospitality sectors. Among the colleges in the city are the University of Alaska and Alaska Pacific University. The University of Alaska, Anchorage's most popular degree programs among the school's 18,154 students include business, health professions, psychology and sociology. Although the school, which was founded in 1954, is the largest university in Alaska, students enjoy a small 11:1 student to professor ratio. Alaska Pacific University, which opened in 1957, is located on a 175-acre campus near the trail system in Anchorage. The school has 732 students enrolled in the school's undergraduate and graduate programs. Some of the most popular degrees granted by the school are in business administration, liberal arts, and parks, recreation, and leisure studies. There are many resources out there to help students choose which college in Alaska to attend. The following are some resources we have compiled to aid students with their research. This agency is responsible for providing adult education to prepare students for vocational training. This organization provides educational services to students in Fairbanks. The Alaska Commission on Postsecondary Education promotes postsecondary education in the state by providing information about schools, financial aid, and resources. This agency oversees education in the state. This non-profit organization supports education on Alaska's natural resources. This website includes statistics about Alaska's community colleges, including the demographics of students. This report includes information about different colleges around the state. Provides educational benefits to members of the military. This site provides online education through the Alaska Department of Education & Early Development. Includes information about schools, scholarships, and student services for the University of Alaska System.